Lori M. Strachowski, MD, is a Clinical Professor in the Department of Radiology and Biomedical Imaging and she is a Clinical Professor of Obstetrics, Gynecology, and Reproductive Sciences at the University of California, San Francisco. 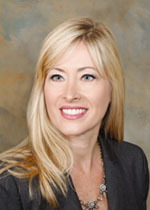 Dr, Strachowski obtained her medical degree from Rush Medical School and did her residency in Diagnostic Radiology at Stanford University in Palo Alto, California. She completed a fellowship in Diagnostic Ultrasound at the University of California San Francisco. Dr. Strachowski’s areas of expertise are ultrasound and breast imaging. She was Chief of Ultrasound at ZSFG for over 18 years, retiring from the role in 2017. Dr. Strachowski has a hands-on philosophy in Ultrasound, frequently scanning patients herself, and she fervently promotes the same by the residents and fellows in-training. Over the years, she has strongly promoted the radiologists' expertise in obstetrical ultrasound by upholding the highest clinical standards, emphasizing compassionate and timely patient care, and providing enthusiastic teaching. She is a strong advocate for excellence in the care of underserved high-risk obstetrical patients, performing exams targeted at the identification of complex fetal anomalies and complications of pregnancy. In an effort provide state of the art services to patients, Dr. Strachowski helped to institute a Nuchal Translucency Screening Program to allow 1st trimester genetics screening and assist in prenatal management at ZSFG. Dr. Strachowski was co-founder of the Avon Comprehensive Breast Care Center at San Francisco General Hospital where she servied as Medical Director for 10 years, promoting a variety of high-quality comprehensive services for women. These include genetic counseling and testing, educational, outreach and support programs and bilingual patient "navigators" assuring every woman is supported and empowered despite perceived cultural and linguistic differences. In 2006, Dr. Strachowski assisted in bringing the Mobile Mammography Van program to serve the Community Health Network of San Francisco, addressing barriers to access and screening. In addition, in 2010, she instituted a Breast MRI (Magnetic Resonance Imaging) and MRI guided breast biopsy program to complete the spectrum of comprehensive breast imaging services available at ZSFG. Dr. Strachowski is a highly regarded teacher. She is a 2009 recipient of the Excellence in Teaching Award from UCSF’s Haile T. Debas Academy of Medical Educators. In 2012, UCSF Diagnostic Radiology residents selected her as the 2012 Hideyo Minagi Outstanding Teacher awardee. Dr. Strachowski was named the SFGH Consultant of the Year by the graduating resident class of 2014 from UCSF Department of Obstetrics, Gynecology and Reproductive Sciences. Dr. Strachowski lectures locally, nationally and internationally and is known for her enthusiastic teaching style, diagnostic pearls and illustrative presentations. Dr. Strachowski has served on numerous ZSFG and UCSF committees, and is an active member of the Society of Radiologists in Ultrasound and American College of Radiology. In addition, she serves as a volunteer consultant and educator for the PanAm WHO sharing her expertise with health care providers in Trinidad and Tobago and has provided assistance in breast ultrasound and US guided procedures in Haiti. Greenwood HI, Lee AY, Lobach IV, Carpentier BM, Freimanis RI, Strachowski LM. Clustered Microcysts on Breast Ultrasound: What Is an Appropriate Management Recommendation? AJR Am J Roentgenol. 2017 Dec; 209(6):W395-W399. Carpentier B, Hayward J, Strachowski L. Enhancing Your Acoustics: Ultrasound Image Optimization of Breast Lesions. J Ultrasound Med. 2017 Jul; 36(7):1479-1485. Jelin AC, Glenn OA, Strachowski L, Vargas JE. Membranous aplasia cutis congenita: a recognizable lesion on prenatal sonography. J Ultrasound Med. 2009 Oct; 28(10):1393-6. Klatsky PC, Tran ND, Strachowski L. A pregnancy complicated by endometrial scarring. Fertil Steril. 2009 Jun; 91(6):2707-8. Lee R, Beattie M, Crawford B, Mak J, Stewart N, Komaromy M, Esserman L, Shaw L, McLennan J, Strachowski L, Luce J, Ziegler J. Recruitment, genetic counseling, and BRCA testing for underserved women at a public hospital. Genet Test. 2005; 9(4):306-12.